Near field scanning optical microscopy (NSOM : Near-Field Scanning Optical Microscopy) is a technique that allows to go beyond the diffraction limit of light by detecting evanescent waves that exist in close proximity to a surface. Since the 80’s, NSOM has been mainly used to optically characterize samples in near field, using different approaches to detect the near field signal such as emission, collection or scattering. 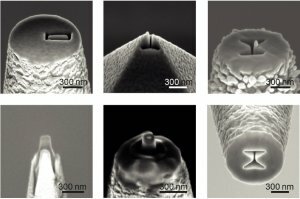 Recently, the progresses in nanofabrication have brought new interest in this technique of characterization, indeed by nanostructuring the near-field probes new properties and functionalities have been demonstrated. In particular, resonating optical nanoantennas specifically designed and nanofabricated on the near field probe (figure 1), open complete new avenues in the field of nanophotonics both at the fundamental and technological level. Figure 1. 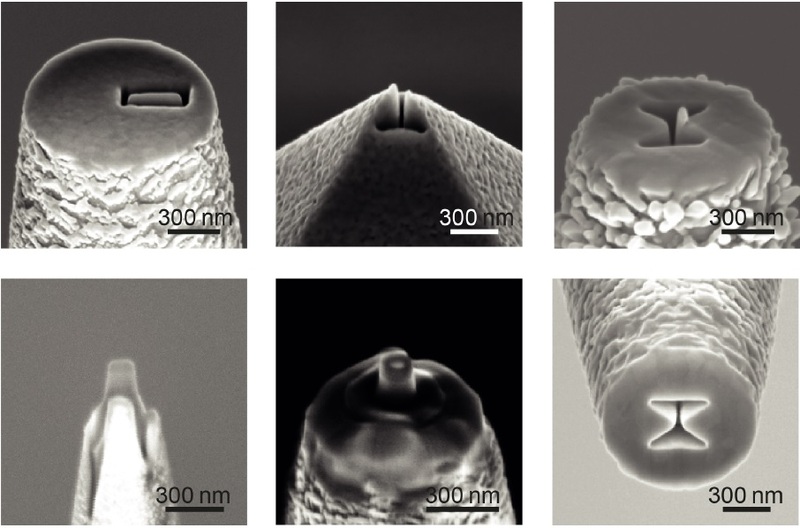 Examples of tips holding optical nanoantennas that we can couple in a deterministic fashion to single quantum emitters. In our group, we use this original approach in our advantage by placing in a deterministic fashion our optical nanostructures in close proximity to a single quantum emitter. By doing so, we are able to completely understand the coupling between an optical nanoantenna and a single emitter such as fluorescent molecules, nanocrystal and magnetic emitter. Through this control we therefore retrieve information about the importance of the emitter position and orientation with respect to the antenna, parameters that are deeply affecting its emission properties (spectroscopy, lifetime, radiation directivity and so on - informations which are crucial for any kind of futur technological applications.